These trains connect downtown Osaka (=大阪) with Kansai airport (=関西空港) and Wakayama (=和歌山). 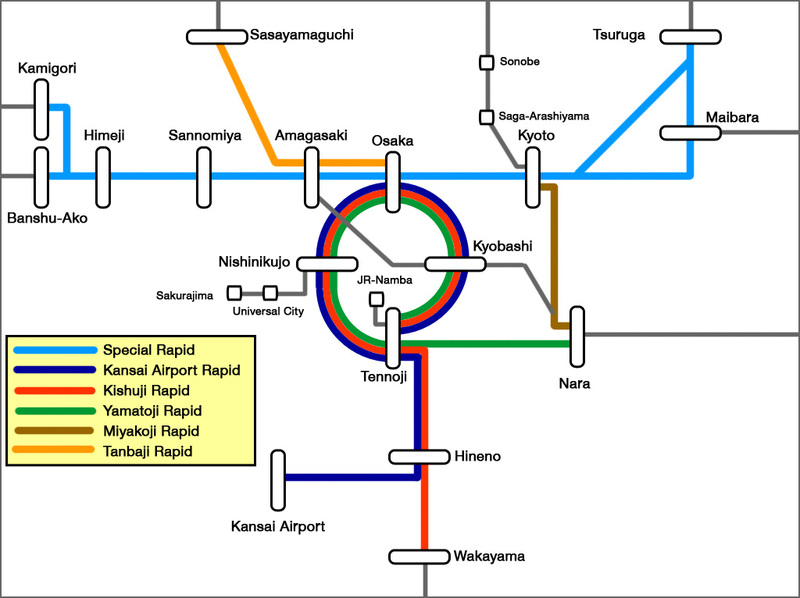 Both Kansai Airport and Kishuji Rapid Services are combined to operate between Tennoji (=天王寺) and Hineno (=日根野). Those trains are uncoupled at Hineno, then each trains go to Kansai Airport or Wakayama. If you arrive at Kansai airport, you can take Kansai Airport Rapid Service instead of airport access express “Haruka“. Of course both Limited Express Haruka and this rapid train are fully covered by Japan Rail Pass. But if you buy a single ticket, you may consider to take this train. JR West operates many commute trains, rapid and local between 5:30 am and midnight. But when you travel in Kansai area by JR trains, special rapid service trains are the best way to travel among cities, like Osaka, Kyoto, Kobe, Nara, Wakayama and Kansai airport. These “Special” rapid service skips many stations and much faster than rapid and local trains. If you use JR pass, you may take limited express trains. But these rapid service trains are sometimes faster than express trains and run much more frequently. That means you do not check the timetable. These are commute trains and mostly very busy in even daytime and late night, but it is convenient. It is a key to understand this rapid train system to travel among cities in Kansai area.